ck here to get free eBay listing software at Auctiva.com. Increase traffic to your listing with Auctiva's FREE Scrolling Gallery. Country/Region of Manufacture Niue. FINE CONDITION. Niue 1941-67 Set of 4v SG 83-86 Fine used. 1941-67 Set of 4v. Fine used. The pages are complete for the period and in very nice shape. 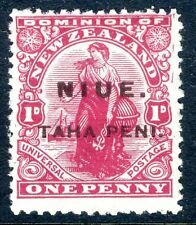 NIUE 1917-21 1d CARMINE SG 24 MINT. 1917-21 1d CARMINE. HINGED MINT. No thins or tears as per scan. The pages are complete for the period and in nice shape. Many pages are empty. A mounted mint example Sg 16a. UK RECORDED (UPTO £100 TOTAL) £2.00. Items are in Mint Never Hinged Set Condition. Scott Cat Value for MNH is 10.00. Sign up for. Member of the Canadian Stamp Dealers Association. ; the fast, easy, and secure way to pay online. Items are in Mint Never Hinged Set Condition. Scott Cat Value for MNH is 17.00. Sign up for. Member of the Canadian Stamp Dealers Association. ; the fast, easy, and secure way to pay online. Niue 1917 KGV set complete very fine used. SG 23-31a. Sc 21-29. Niue 1917 KGV set complete very fine used. Gibbons # 23-31a. Scott # 21-29. 1931 NIUE opt Arms set 2/6-£1 Postal Fiscals. VF fresh M. SG 51-54 cat £140. (4). O Extra Fine (EF): Outstanding condition, equal balanced margins. The stamp(s) are sold as seen. This will be completed to the value of the order. Requests to declare lower amounts than the actual value of the contents will be ignored. I pride myself on the service provided. Die proofs by Perkins Bacon of the landing of Captain Cook at Niue and profile of Captain Cook. WE WILL HAVE TO OPEN AN UNPAID ITEM CASE. RECEIVED AFTER AN UNPAID ITEM CASE EXPIRES YOU WILL. DE SUPERARSE ESE LÍMITE, TENDREMOS QUE ABRIR UN CASO. BE PERMANENTLY BLOCKED. 1938 3/- Blue & Yellowish-Green. MOUNTED MINT. UK RECORDED (UPTO £100 TOTAL) £2.00. UK ORDINARY (UPTO £40 TOTAL) £1.00. Items are in Mint Never Hinged Set Condition. Scott Cat Value for MNH is 4.50. Sign up for. Member of the Canadian Stamp Dealers Association. ; the fast, easy, and secure way to pay online.